For those of us with watery eyes, finding eyeliner that is long-lasting can be a nightmare. Either the formulas are too drying or the product just wipes right off. It's completely frustrating. Don't waste your time on products that don't work for you. Reach for long-wear liners instead. No matter how watery your eyes get, defend your line with smudge-proof, water resistant formulas. Eye makeup streaks are a thing of the past. There is no more excuses for winged liner that fades away. Beautiful eye makeup is always on trend, and now it's attainable for those of us with troublesome eyes. Whether you prefer pencil, gel, or liquid liners, there is a product out there for you that will keep your eyes defined all day long. No tricks or tips required. Just apply and go about your day. No matter if you're battling a windy commute or a stuffy office, these options will go the distance against your tear-filled eyes. So, put away those cotton swabs and tissue papers. There won't be any streaks today – just beautifully rimmed eyes. Wondering what will stay put on your lids? Here are a few of my favorite long-lasting eyeliners that hold up against watery eyes. This is a lot of people's favorite pencil eyeliner for a reason. This silky pencil glides on like a dream (hence its name), and really does stay put on watery lids, speaking from experience. Change up your everyday look with this pencil by choosing a non-traditional color. One of my personal favorites is the shimmery purple shade, Delinquent. If you love the concept of the Urban Decay eyeliner, but don't want to spend $20, then test out this Rimmel eyeliner instead. The formula is super creamy, so it's perfect for those who like to smudge out their liner. Plus, it's waterproof meaning that it won't fade away during the day. According Jane Kim, Assistant Editor of TotalBeauty.com, this eyeliner "lives up to it's claim" as a long-lasting option. No smudging here! Plus, the felt tip applicator is great for those who want the look of liquid liner without the mess. If you're looking to define your eyes, but don't want your liner to disappear by the end of the day, reach for this Lancôme liquid liner. The tip of the product is pretty firm, so creating a thicker line is fool-proof with this smudge resistant liner. 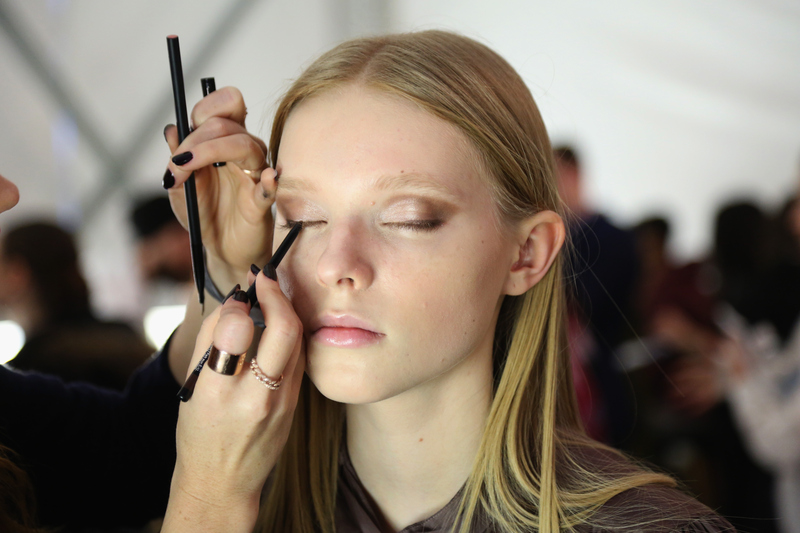 This gel liner is a dream come true for those with oily lids or watery eyes. It simply doesn't budge all day. The formula is super creamy, so it's easy to place along your lash line. Simply put, this eyeliner rocks. Create a long-lasting, smokey line is no time with this easy to use pencil. This is an eyeliner that will survive even the windiest of commutes. Once applied, this stays put. No mid-day smearing or creasing here. Just deep pigmentation, and a long-lasting line. If you're like me, it may seem impossible to keep eyeliner in your waterline. Not anymore! Revlon's Colorstay Eyeliner is absolutely magical for watery eyes. This stuff has some serious staying power. Crying off your eyeliner is a thing of the past. No matter wind, rain, or shine, these pencils, markers, and gels are staying put.